The Liberty Double Eagle no motto (Type 1) was first authorized by Congress on March 3, 1849. 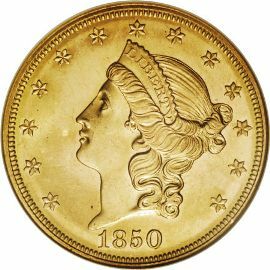 The need for a large twenty dollar gold coin was spurred on by the incredible amount of gold being mined in California at that time. This particular variety was produced from 1849 to 1866 at various U.S. Mints including Philadelphia, New Orleans, and San Francisco. 13 stars signifying the original thirteen colonies, with the date below. The reverse depicts an eagle with a shield on its breast that is modeled after the Great Seal of the United States. 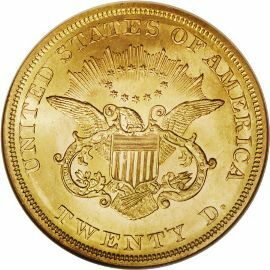 The inscriptions read "UNITED STATES OF AMERICA" above the eagle and the denomination "TWENTY D." below it. The value of gold coins has risen over the past ten years considerably, along with precious metal prices, and these coins are no exception. They are a great type coin, but sometimes very difficult to find.